Some DIY projects can seem daunting when you look at them, but they actually turn out to be pretty easy to make. 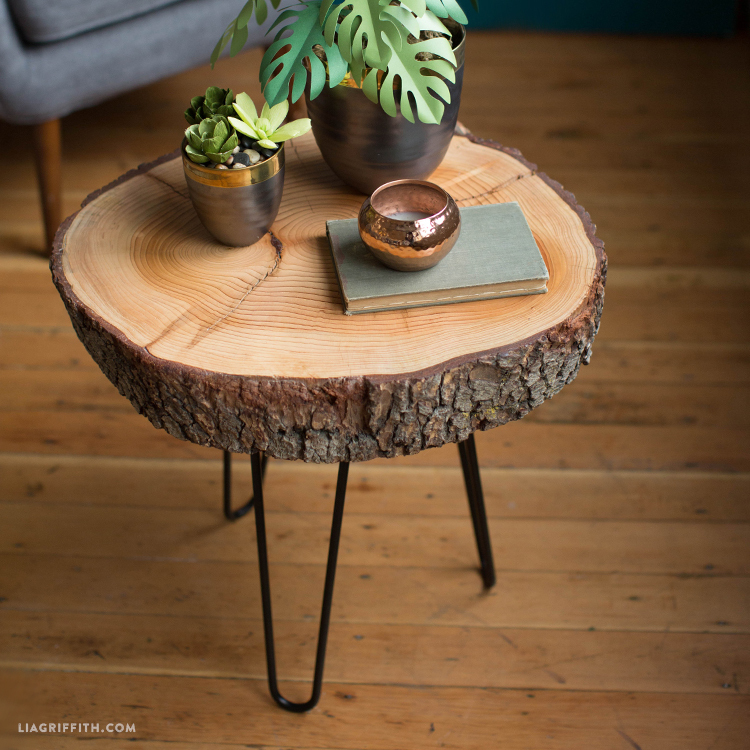 This DIY wood slice table is a great example of that. You really only need a few materials to make this stylish surface that you can use as a coffee table or side table. Plus you will have the glory of knowing that you made it yourself! If you love incorporating natural materials into your home decor, this could be the perfect weekend project for you. Gather the tools and materials listed above. Sand the top of the wood slice until you achieve a smooth surface. Start with a medium grit sandpaper and work your way up to a finer, higher grit. Finish the table with a protective coating according to the product instructions. We used Osmo Top Oil, a natural oil and wax blend, because it is non toxic and water resistant. You can also use polyurethane, Danish Oil or similar. After the recommended drying time, flip the table and determine placement of hairpin legs. The legs should be close enough to the edge that the table is stable, but shouldn’t extend out past the tabletop edge. Mark placement with a pencil. Screw the hairpin legs onto the wood slice using a drill. You may need to pre-drill holes for the screws or just tap them with a hammer to keep in place before screwing. Flip the table and make sure leg placement works and the table is stable. 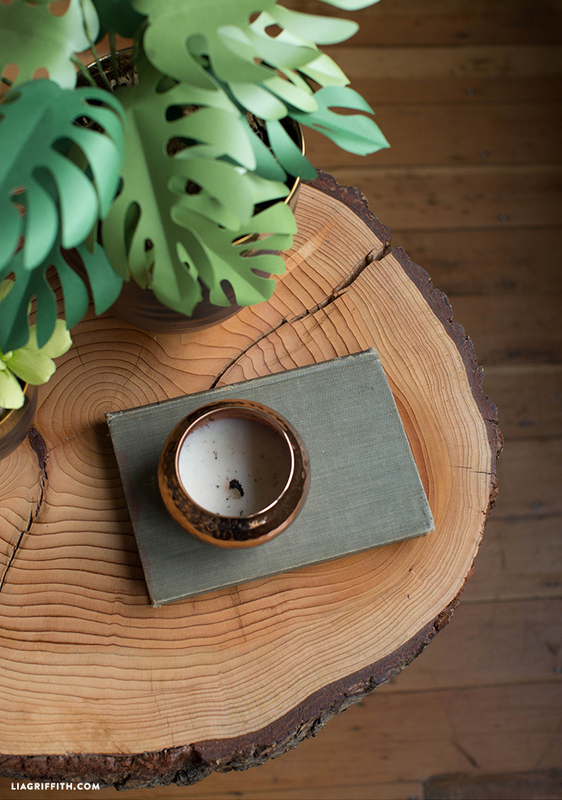 The most important part of making your wood slab side table is of course finding the wood. We were lucky enough to find a great deal from a woodworker on Craigslist, so we definitely recommend starting by looking there. If not, you will probably have some luck at your local lumber store. Another source that we found is The Lumber Shack, or you can find smaller wood slices here. Keep in mind that shipping might be costly if you buy your wood from a source that isn’t local. The wood is extremely heavy! 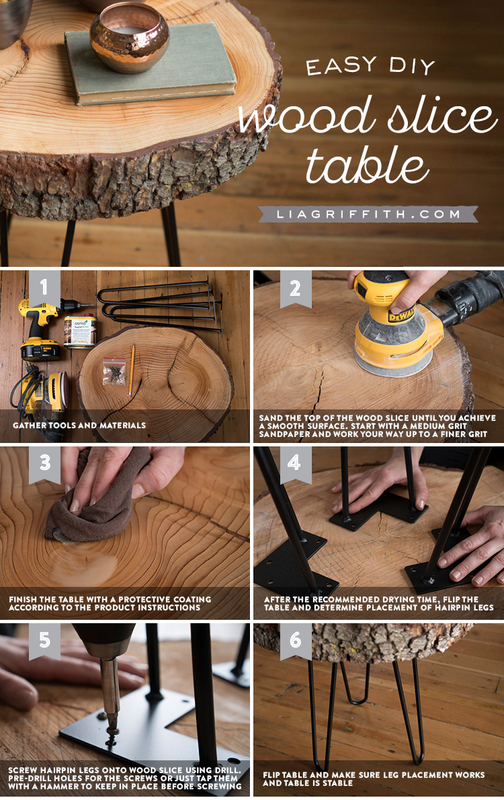 Our table has a diameter of about 24 inches, but you can make a table in any size using this tutorial. We added a link to the exact hairpin legs that we used in Shop this Project below, but there are lots of sources for hairpin legs. And they come in a variety of colors so that you can customize your wood slice table to your specific color palette. 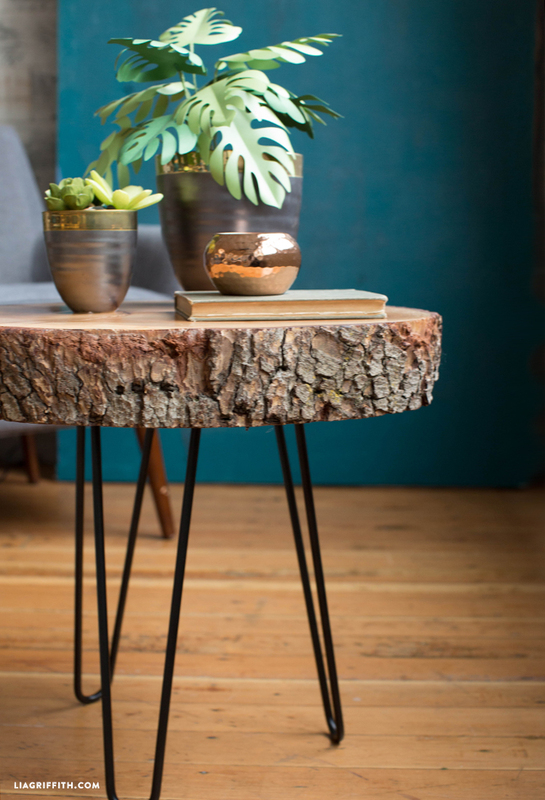 We love that the hairpin legs can give this table a mid-century feel, while still maintaining that rustic Pacific Northwest style that is near and dear to our hearts. 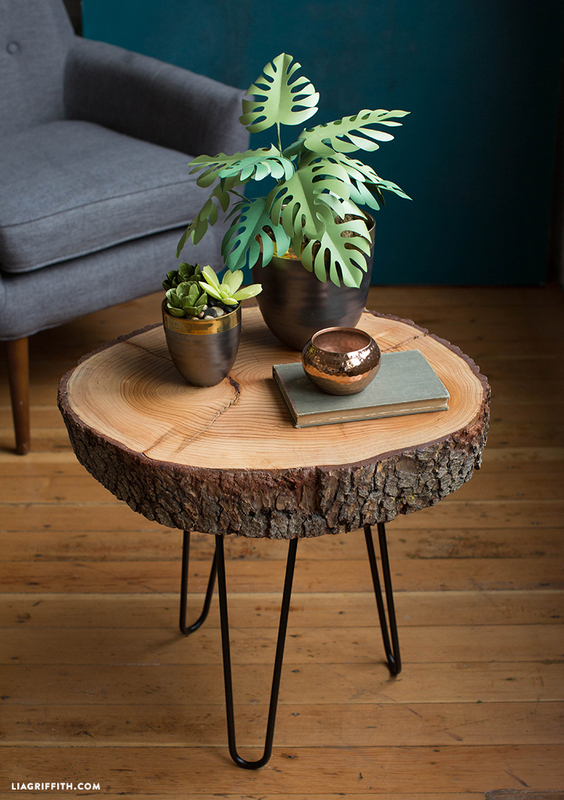 Once you finish your handcrafted side table, style it with some paper botanicals like our split leaf philodendron or adorable crepe paper succulents. We just had a very large oak cut down on my Mom and Dad’s land. It is about 4-5 feet in diameter and 297 years old! We girls want a slice of the tree to make a coffee table. How thick should make each slice? This is an amazing tree and means so much to us to get it right! Is there a company that makes such a thing? None of us is handy that way. I want to put wooden legs on my slice. Oh wow! I don’t know of a company that makes something but you could always look for a local carpenter/contractor to help. The thickness should work with whatever legs you choose and how much weight the can handle. Mine was about 4-5″ thick and worked great with the hairpin legs. We just had a tree cut down- do I need to dry out the stumps or treat them in some way before sanding and using the oil? Hi! We used wood was previously dried and pre-treated for use to make furniture. We would recommend you let the stump dry before sanding or treating it with oil. As far as treating the stump, you might want to ask your local hardware/crafts store what they would recommend for treating raw wood! We hope this helps! We used Osmo Top Oil, a natural oil and wax blend, because it is non toxic and water resistant. You can also use polyurethane, Danish Oil or similar. Hello. What kind of wood did you use? Where can I find the hair pin legs? Hi Marie, there’s a link to the hairpin legs at the bottom of the post under “shop this project”.